With the emergence and popularity of social media, there has been a paradigm shift in the way businesses engage with the customers, clients and channel partners. Experts say that entrepreneurs do not want to leave a single chance to interact, engage and reflect. Experts say that CRM or Customer Relationship Management software not only helps in enhancing the operational efficiency, but it also helps in building a relationship and elevating sales graph. It is the best example of leveraging technology to form ongoing, meaningful and fruitful relations. Daebuild is a renowned name in the field of CRM systems for real estate management. It has been there in the market for quite some time, and the team is always busy in releasing new versions with advanced capabilities and functionalities. Keeping in mind the increasing need of establishing relations with customers for increasing business, the new versions of CRM bring innovative and interesting ways. Here are some examples of how can the new and improved version of Daebuild help real estate businesses. Is there IPL match in your town? Or Shankar Mahadevan is going to perform in the Town Hall? Or there is a rock concert in the stadium? Yes, events keep on happening in the town, and different customers of yours are passionate about different events. 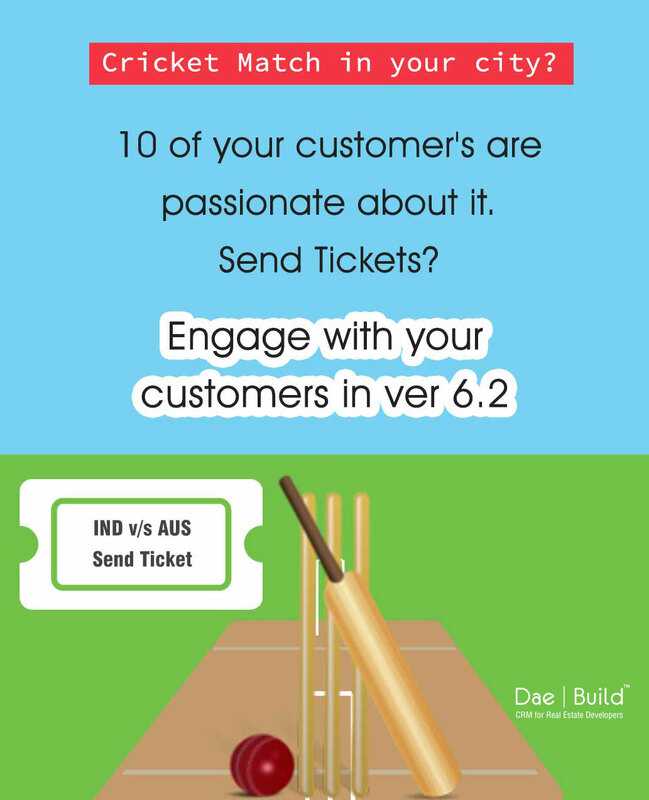 With the latest version of Daebuild CRM, you can store the interests or passions of your clients as well as engage with them through it. You can inform them about the latest happenings in town according to their interests and arrange a free screening of a movie or arrange a discount coupon of the famous hairstylist. You can also send them birthday or anniversary greetings directly from the CRM. All this is possible with the new version. It will tremendously help you to refresh your brand identity in your customer’s mind. According to market experts, the real estate business owners must know about customers who visit the construction sites. Yes, they are the potential customers who would very likely purchase the properties if they find it interesting. The new version makes it possible for you. 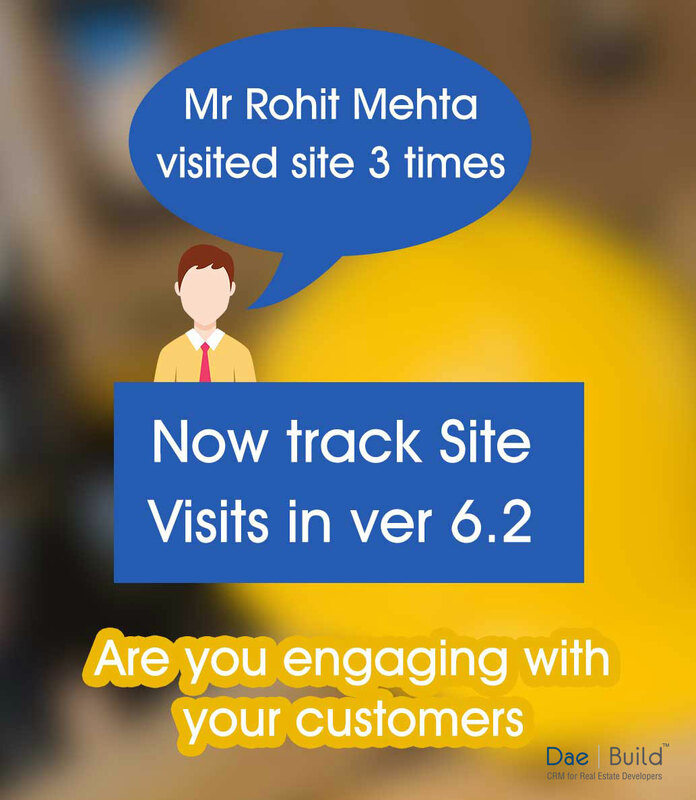 Now you can track who visited the site and how many times in the past? The more are the visits; the higher is the possibility of buying. Earlier, you didn’t have a method of tracking it. With the latest version, you can very well tap the same. Hot leads or hot inquiries have very high potential of selling the property. Experts say that one should not miss it in any case. However, earlier there was no option of tapping such requests. 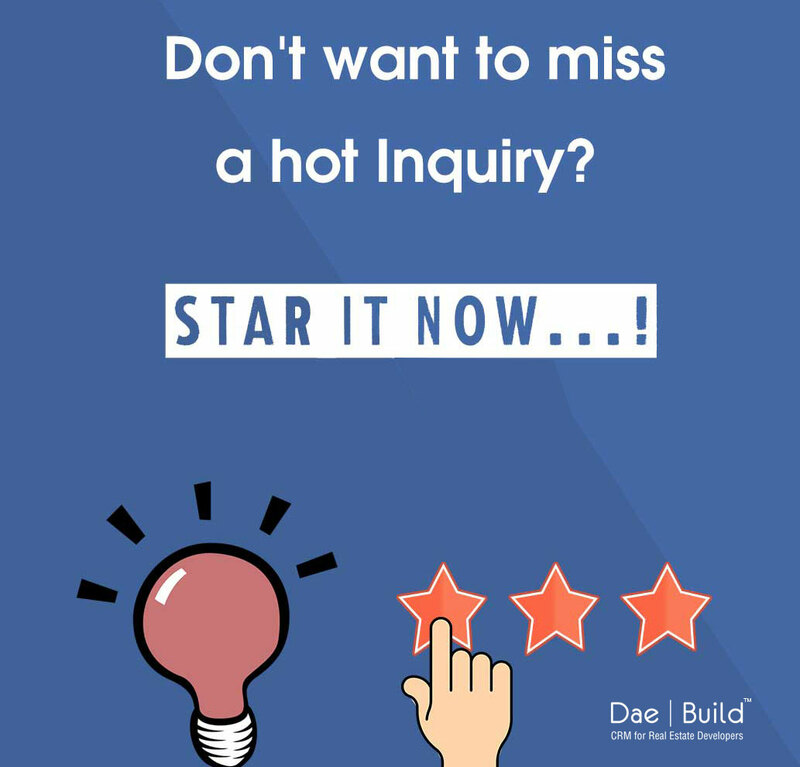 With the latest version of Daebuild CRM coming in, you can mark them as favorite and make your starred inquiries, a priority. Those inquiries will always be on the top of your database. Well, closed calls are not actually clutter, but you must hide it from the CRM systems. In the latest version, you can conceal it from the list. It helps in tracking the calls more accurately and easily. Using the configurable list management system, you can define filters and selection criteria for better order management. You can now hide these inquiries instead of removing from database. So, you can get them back whenever it is needed. With the increasing diversity of the business, you need multilingual support for automation. With the new version of Daebuild CRM, it is possible to send documents like allotment letters in multiple languages through email. Various document types are supported for your convenience. Now automate the mailing process as soon as the allotment letter is generated in the system. Such intelligent tools reduce the dependency on manual processes and increase accuracy. You don’t miss the customer touch points and establish a better relationship. When you offer real estate choices to clients, at times, they block the property for a certain period. They arrange the funds or complete the loan formalities meanwhile. It happens many times that the buyers can’t arrange the funds within the stipulated time or they change their mind. You need an intelligent system to manage all this. 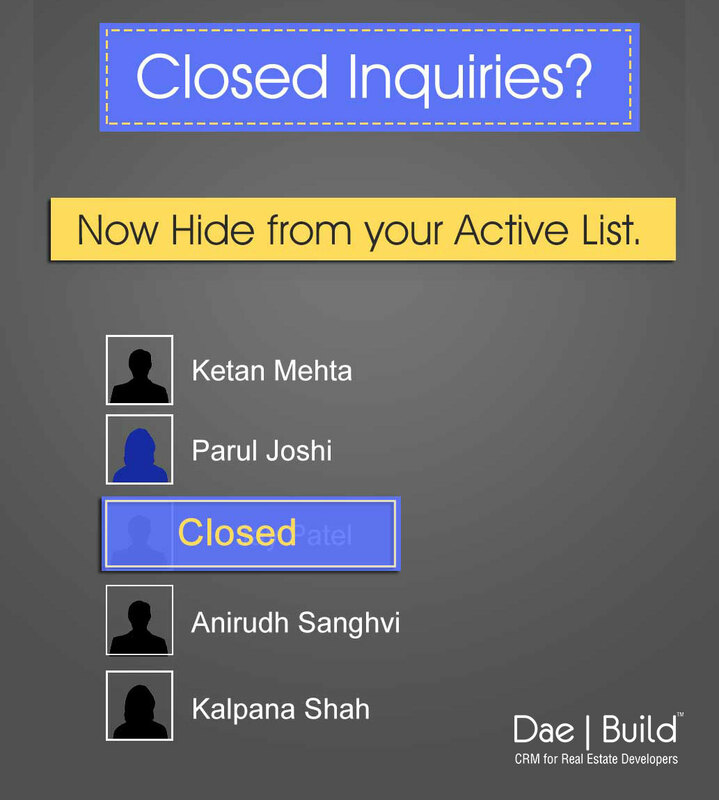 The new version of Daebuild makes it quite simple for you. Now, block and unblock the property according to the requirement, send reminder letter before you unblock. It is a great way of interacting with the customers in a great manner. You can also choose to never unblock a certain unit. The user has the control on it. Since everything is configurable as well as automatic, you needn’t worry about the accuracy of it. 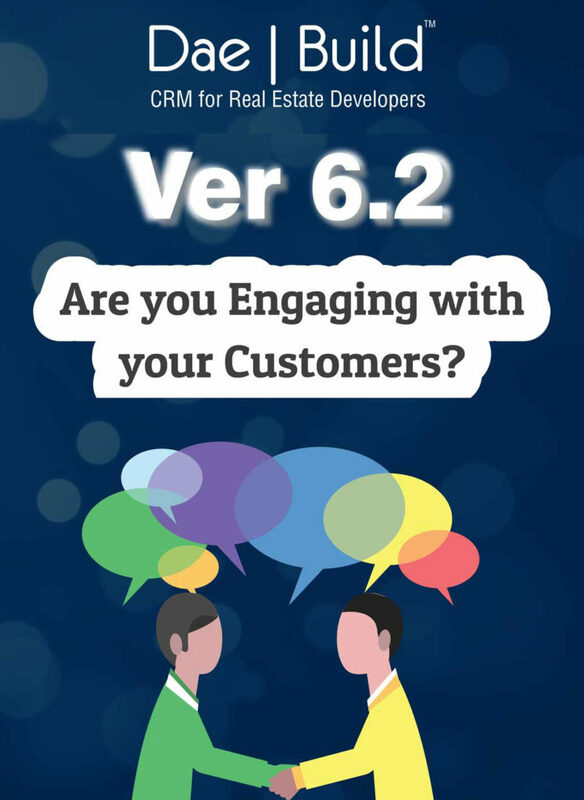 Why do you need customer engagement at all? Well, it is impossible to do the business today unless you build an excellent customer relationship. Engagement is the basic quality required in the modern business world. For real estate business, it is all the more important. Estimates say that business owners that engage with their clients clock 20 to 40 percent increase in the sales figures. How can the business get such an enormous boost? It happens because you integrate customer service into the business seamlessly by engaging customers effectively. It no longer remains an isolated element that requires special attention. You can extend the best services by engaging them meaningfully. Today, customers feel more comfortable when the real estate service provider interacts frequently and effectively. They like to get the information about the latest projects, development status of the project they are looking for, and information about the promos and features. Buying a smart version of CRM system is the key to success. With the enhanced features and functionalities, you can establish a better relationship with the client and take the business to new heights.